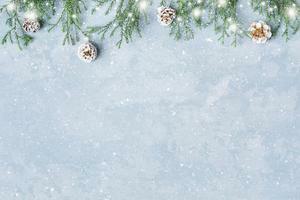 Links for the kids to play Christmas Games This December. 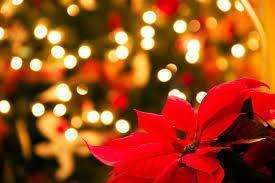 Go to the bottom of the Students Recourse page and find all the Christmas Games and Santa Tracker! Merry Christmas from the WES Computer Lab! 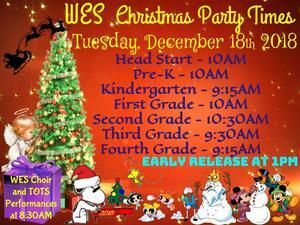 Kindergarten will be having some great Christmas Fun Days before our WISD Christmas Break. 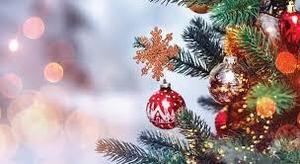 The WES Annual Second Grade Christmas Play will be held on Thursday, December 13th 2018 for the WES Students and on Friday, December 14th 2018 for everyone else! Each day starting at 9 AM at the WES Cafeteria! On Thursday, December 13th, the Second Graders will be heading to the North Pole of Texas at Screw's Farm in Pickton after their Christmas Program. 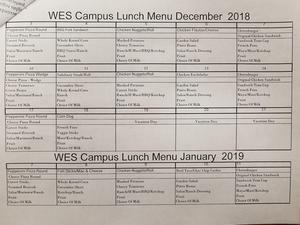 Here is the Lunch Menu for December 2018. You can always find the School Breakfast and Lunch Menus under the Student or Parent Drop-down boxes on any of the Campuses' School Websites. 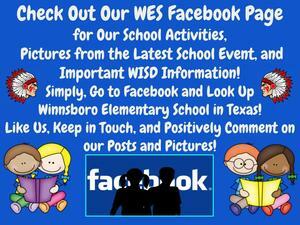 Check Out Our Winnsboro Elementary School Facebook Page for Pictures, Information, and Posts! Santa Claus is coming to town and he’s making a stop at Winnsboro Elementary School! 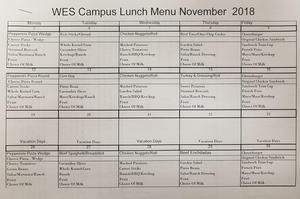 Here is the Lunch Menu for November 2018. 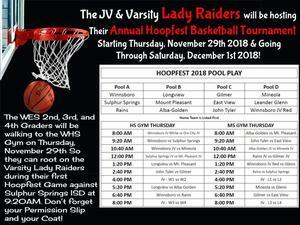 The WES 2nd, 3rd, and 4th Graders will be walking to the WHS Gym on Thursday, November 29th So they can root on the Varsity Lady Raiders during their first Hoopfest Game against Sulphur Springs ISD starting at 9:20AM. Don’t forget your Permission Slip and your Coat! 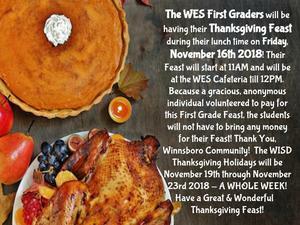 The WES First Graders will be having their Thanksgiving Feast during their lunch time on Friday, November 16th 2018! Their Feast will start at 11AM and will be at the WES Cafeteria till 12PM. Because a gracious, anonymous individual volunteered to pay for this First Grade Feast, the students will not have to bring any money for their Feast! Thank You, Winnsboro Community! The WISD Thanksgiving Holidays will be November 19th through November 23rd 2018 - A WHOLE WEEK! Have a Great & Wonderful Thanksgiving Feast!